and 80 km northeast of Valparaiso. 10c orange roulette of 1885 (Sc. 29) and a 15c dark green of 1892 (Sc. 30). Certificado (registration) label applied in Valparaiso stamped 18135. The stamps are cancelled with 3 San Felipe CDS. There is also a Valparaiso certificado CDS on the reverse dated August 28. The destination of the cover was Pelotas, Rio Grande do Sul, Brazil. in Rio de Janiero on September 16. 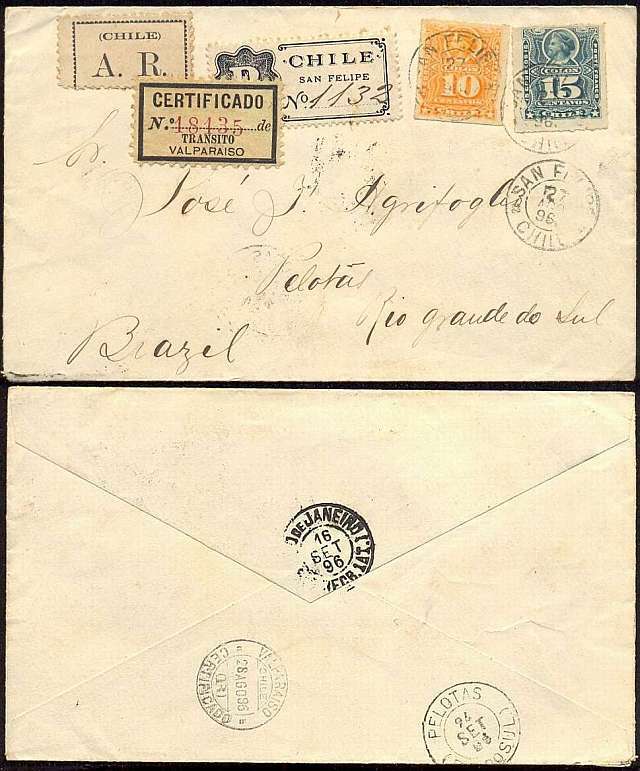 The Pelotas, Rio do Sul receiving back stamp appears to be dated 23 September. Pelotas is on the Atlantic coast at the very south end of Brazil about 130 km from Uruguay. It is the third largest city in the southern state of Rio Grande do Sul. it depends on an agricultural and commercial economy.